New Delhi: A teacher in Rajasthan noticed that while students would enroll for class, not many would attend regularly. To stem this problem he came up with an innovative solution: He announced that he would give a coconut to the student who had the best attendance every month. The incentive worked. This was one of the stories that egged on Dr. Vijaya Sherry Chand, Professor at the Indian Institute of Management (IIM) Ahmedabad and head of the Education Innovation Bank (EIB) to create a database of such innovators and their innovations, which won his project the Helwett Packard Education Innovation Fund for India (EIFI). The Indian Institute of Management, Ahmedabad, was today awarded a sum of Rs one crore for their ready-to-scale project ‘Education Innovation Bank’ , which is designed to improve the quality of education in the public school system based on the work of innovative school teachers. “We’re delighted to receive the EIFI grant. We have been working on the idea for some time now, and the award will clearly help us to further scale the project,” Chand said. 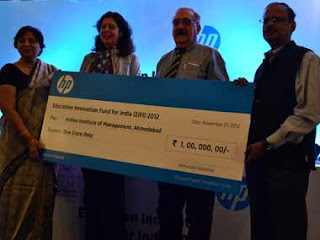 The award, instituted by Helwett Packard, is the first nationwide fund in India with a focus on innovations in education through a fund called the Education Innovation Fund for India (EIFI). “Sustainable innovation is fundamental to our business and we recognize the importance of delivering holistic education in a practical, application oriented manner,” said Neelam Dhawan, Country Managing Director, HP India. The winning entry by IIM-A is a decentralised peer-driven professional development network for teachers, which identifies and validates the work of innovative teachers and makes it accessible in usable formats to other teachers, teacher training networks and education administrators. With the EIFI grant the project will be scaled via the internet that will feature a searchable electronic database of innovative teacher practices and localized teacher development networks. The Educational Innovation Bank will also serve as a resource for policymakers to evaluate grassroots innovations that can be implemented as best practices in other districts. “The Educational Innovation Bank builds on the strengths of those teachers who experiment and innovate on their own in order to solve educational challenges in their immediate environment. As these challenges often need to be solved in isolation, teachers are now enabled to collaborate and exchange ideas with their peers which leads to promising solutions and to informed policy decisions,” Dr Chand said. In addition to the mega prize winner, IIM-A, there were 15 others who won Rs. 15 lakhs and two who won Rs. 10 lakhs for their projects. Forty smaller grants ranging from Rs. 10,000 to Rs. 140,000 have also been handed out as part of EIYI Young Learners and EIFI Young Innovators awards. The $1 million fund is designed to promote, education projects that use innovative learning approaches in Science, Technology, Engineering and Mathematics, pedagogy, curriculum and holistic learning to advance education delivery and reach in India.